Hello everybody! Wes here. Our customer and friend, Trey, made the following blog post for us about switching from extract to all grain brewing using the Brew in a Bag (BIAB) technique. Check it out below! Greetings, extract brewers! If you have come across this blog, you have most likely done a few batches of extract brewing and you are looking to switch over to all grain. If that is the case, you have made a great choice! As homebrewers, we aspire to learn and improve our techniques. Switching from extract to all grain is one of the biggest steps you can take as a homebrewer and, in the end, it will definitely benefit you! Here are five great reasons to switch from extract brewing to all grain brewing using the Brew in a Bag (BIAB) method! The extract version of brewing is pretty straight forward. You heat up your water to a certain temperature, add your steeping grains, let them soak for a bit, remove them, add dry malt extract or syrup extract and heat it up to a boil to start your boil schedule. Now let’s talk about all grain brewing for a moment. With all grain brewing, well over half of your grains are going to be a base grain such as Pale 2 Row or Pilsner malt. The dry or syrup malt extract is just an extracted and concentrated version of those base grains so that you’re introducing a few pounds of dry malt extract instead of ~10 lbs of crushed base malt to get the same amount of sugars and, in the end, the same alcohol content in your finished beer. With the Brew in a Bag (BIAB) method, your steps are heating the water up to a certain temperature, adding your crushed base and specialty grains to the Brew Bag, holding the temperature for an hour, removing the grain-filled bag, and then proceeding with the boil schedule as normal! These two methods are very similar, you are just dealing with much more grain and holding them at a set temperature for a longer time. You will end up saving money! It is true! Let’s take a look at a few of our best selling recipes. Our Brain Eater (Zombie Dust clone) extract kit, at the time of this blog post, costs $62.99 whereas the all grain kit is $44.99. Our Hearts Squared (Two Hearted clone) extract kit at the time of this post is $52.99 whereas the all grain kit is $29.99. Why is this? With extract brewing, the dry malt extract or syrup you use is basically concentrated wort that companies such as Briess make by extracting sugars from grains such as Pilsner malt and making it into a dry form or syrup form. Briess takes the extra steps for you to extract the sugars whereas with all grain brewing, you do this yourself! Typically, with the higher amount of sugars needed, ending in higher ABV, the higher the difference will be in cost. If you just look at the difference in one kit, it may not seem all that much, but after a few batches you will end up saving money! One hesitation you may have with switching to all grain is the amount of equipment required. 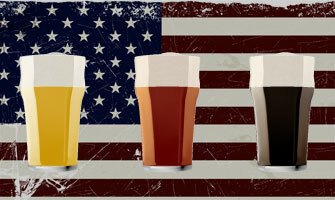 You will see a lot of videos or guides on all grain brewing showing three main vessels. You have your mash tun, a hot liquor tank, and a boil kettle. The Brew in a Bag method requires… one vessel! Just one large kettle that you mash in and boil in. With that being said, you will almost definitely need to upgrade your kettle as with brew in a bag you will want to do a full volume boil and it also needs to be able to hold up to around 15 pounds of grain, the brew bag, and the water that will become wort during the mash. With extract brewing you can do a partial boil, just filling your kettle as much as you can and then if you need to add water to your fermenter you can do that. With all grain, to maximize your efficiency and hop utilization, you really need to do a full boil so that after your boil schedule is done, you end with around 5 gallons of clean wort to transfer to your fermenter. So, while you may need to upgrade your kettle, you can simply purchase one new piece of equipment instead of three. This makes it easier and more economical to switch to all grain at the time of purchase, but also for all brew days to come. This allows you to save space in your home and you save time as well as I will describe below! Another hesitation you may have had when thinking about all grain brewing is the difference in time it takes for a brew day. This is due to a few different factors. The two main factors would be the amount of liquid of which you need to change the temperature, and the mash – where you convert the grain starches to sugars. 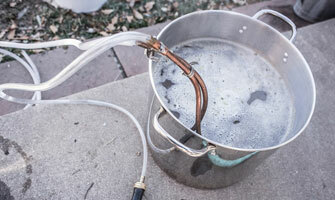 Because you would be doing full boils, it will take you more time to raise the water to mashing temperatures and a little more time to bring the wort to a boil. In comparison with three vessel all grain brewing, you save time with BIAB as you do not need to do a process called sparging. In typical all grain brewing, after the mash, you sprinkle hotter water on top of the grains in the mash tun to extract additional sugars. This process is called sparging and can take around an additional 45 minutes. The Brew in a Bag method does not require you to sparge as the grains can be crushed more finely since you are using the brew bag. The finely crushed grains allow you to convert to sugars more easily. Simply remove the grain bag out of the kettle and let the wort drain out of the grains and then continue on with the boil! While using the BIAB method does take a little longer than extract brewing – it is definitely worth the change when considering all of the other benefits, and brew in a bag is the fastest method of all grain brewing! You know what they say about brewing. Cleanliness and sanitation are the most important part of it! The good news is that with BIAB, you are not adding much to your clean up time, and you definitely save time when you have just one vessel to clean instead of three. Not to mention the cleaning supplies such as PBW that you save money on. The brew bag is made to work well when brewing, but it is also made to be very easy to clean. After emptying the brew bag as much as you can, simply turn the bag inside out and wash the grains off until it looks like new again, then store it away until your next brew day. You can empty and wash out the brew bag while heating the wort up to a boil, so you save time cleaning while still brewing! In conclusion, the Brew in a Bag method is a great way to get into all grain brewing! You will end up saving money by extracting all of the sugars from the grain on your own, you will need to purchase the minimal amount of additional equipment, know that you are still brewing in a timely manner, and have a simple clean up at the end of the day! If you are ready to get started, check out the larger brew pots as well as the brew bags we list on our site! If you have any questions feel free to call us at 888-463-2739 or email us at customerservice@greatfermentations.com.